We received a discount from the Montshire Museum of Science for our entrance fee. The cost of admission is $6.00 and that will also allow us to see the Covered Bridge exhibit as well as the rest of the museum. We will be serving coffee, tea and snacks during the meeting. You will either have to bring your own lunch or go out to eat in Hanover or Norwich. 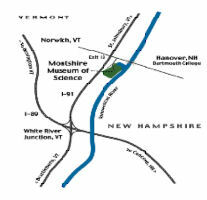 The Montshire is located off exit 13 (watch for the Montshire interstate sign), I-91 in Norwich, VT, five miles north of White River Junction, VT, directly across the Connecticut River from Hanover, NH, home of Dartmouth College. From Brattleboro: Take I- 91 north to Exit 13. At the end of the ramp bear right, turn right again onto Montshire Rd. From St. Johnsbury and points north: Take I-91 south to Exit 13. At the end of the ramp take a left turn and go under the overpass. Watch for signs. Take a right just past the traffic light. From Rutland: Take Route 4 East through Mendon, Killington, West Bridgewater, Bridgewater Corners, Bridgewater, West Woodstock, Woodstock, Quechee and White River Jct. Follow signs for Route 5 north. Turn left onto Route 5 north [go about 5 miles]. Go through Wilder and in Norwich at the traffic light turn right and go under I-91. At the next Traffic light look for signs for Montshire Museum. Turn right just passed the traffic light. From Burlington: Take I-89 south to White River Jct. Then take I-91 North [about 5 miles] to Exit 13. At the end of the ramp bear right, then turn right towards the museum. From East Middlebury: Take Route 125 East to Hancock [about 16 miles]. Turn Right onto Route 100 South and go about 14 miles to Stockbridge. Go another mile to the Junction of Route 107 [Turn Left and head towards Gaysville and Bethel. Turn right under the Railroad overpass and continue on Route 107. In about 2 miles you'll come to I-89. At this point you could either take I-89 south to White River Jct. Then take I-91 North [about 5 miles] to Exit 13 OR pass under I-89 to the Junction of Route 14 - Turn Right onto Rt. 14 South. You'll pass through South Royalton, Sharon, West Hartford, Hartford and into White River Jct. Turn left onto Route 5 North and go about 5 miles through Wilder and at the traffic light next to I-91 turn right and go under the overpass. Look for signs for the Montshire Museum. The Turn for the Museum is right next to Exit 13. Turn Right onto the museum road. From Bennington: Take Route 7 North to Manchester [Exit 4]. At the end of the ramp bear right up the hill onto Rt. 11 East. Continue on Rt. 11 [about 30+/- miles through Peru, Londonderry, Chester and finally into Springfield. Continue on Rt.11 about 4 miles until you come to I-91. Head north on I-91 for about 35 miles through White River Jct. and on to Exit 13. Look for signs for the Montshire Museum. The turn for the Museum is right next to Exit 13. Turn Right onto the museum road. According to the World Guide to Covered Bridges, 1989 edition, The 94-foot Upper Darby bridge, WGN 35-80-01, was built in 1868 using the Partridge truss. by Cathy Harkrider August 6 - Parke County, Indiana - The Parke County Tourist Information Center reports that Jesse Lee Payne, who burnt the Bridgeton Bridge, Jeffries Ford Bridge and attempted to burn the Mansfield Bridge could be facing an indefinite commitment to a state mental hospital, according to reports to Parke Circuit Court Judge Sam Swaim. A new "Comprehension to Stand Trial" report received on July 27 from Dr. Robert Sena at Logansport State Hospital, states that Jesse Payne could remain in a state facility indefinitely. The reports states "to a reasonable degree of medical certainty. David C. Fischetti, PE of DCF Engineering and bridgewright, Arnold M. Graton of Ashland, NH provided consultation services in a Design-Build contract with Intech Construction under the auspices of the Kentucky Transportation Cabinet. Steve Donovan of the Buffalo Trace Covered Bridge Society and Patrick Kennedy of Kentucky Heritage were among the advocates instrumental to the success of the project. The Dry Stone Conservancy, of Lexington, KY coordinated reconstruction of the stone abutments. Friday, June 30, 2006 I have been in correspondence with Chris Young, a Columbia County (PA) Commissioner and President of the Columbia County Covered Bridges Association in regards to the flood damage in their area. On wednesday as you are already aware the West Paden Tin Bridge was washed away. Now, the Josiah Hess Bridge, PA-19-10, is in danger of collapse. Wednesday, June 28, 2006 - As you are probably aware, much of central and southern New York State is flooded and in a state of emergency. I just received a call from Dave Peterson who is the Manager of Glimmerglass State Park where the Hyde Hall Covered Bridge is located. The situation is not good. The park is completely flooded and, of course, closed. Shadow Brook has now reached the bottom of the bridge and if the rain doesn't subside, will soon spill over onto the deck of the bridge. Although that is not good, bridges have been known to survive a little water and the Hyde Hall Covered Bridge has survived for 181 years so I am trying to remain optimistic. Dave's main concern is what debris may come down stream and hit the bridge, possibly taking it off its abutments. If this should happen, we will more than likely lose this bridge. Wednesday, June 28, 2006 - I received a forwarded email message this evening from Tom Kipphorn, member of the TBCBSP, with the terrible news of the loss today of the West Paden Twin Bridge, PA-19-12, in Columbia County, PA. Yes, it was just a little over a month ago (May 25, 2006) that many of us gathered there to celebrate the refurbishment of the Twin Bridges & Park. Little did we know that day that it would be short lived. The West Paden Bridge was the Burr truss bridge and the longer of the two twin bridges and the one directly over the channel of Huntington Creek. As most of you are aware, Pennsylvania and many states in the Northeast and Middle Atlantic region are suffering devastating flooding at the present time. It seems that two nearby cottages in the vicinity of the West Paden Bridge were swept away by the flood waters and lodged against the bridge causing it to be destroyed as well. Please check out the website www.bentonnews.net/home.htm for a photo of the destruction. Summer is almost over and I'm not sure just where it went. It seems like summer arrives and before you know it, it's gone. But none-the-less, I hope you had an opportunity to visit some of our bridges. If not, don't let the autumn season pass you by without taking time to visit them. It is such a spectacular time to photograph them. The Vermont Covered Bridge Society welcomes new members Bruce and Pat McDonald from Barre, VT, Paul & Deborah Lindberg, Enfield, NH, and Jack Tecce, Derry, NH. Welcome to the Vermont Covered Bridge Society. Although we may not want to think about it, this is just a reminder that the holidays will soon be upon us. For our members who like to shop early, don't forget a gift certificate for a membership to the Vermont Covered Bridge Society is a gift that keeps on giving throughout the entire year. We will once again be offering our Early Renewal Contest. This contest has been a huge success and helps the Society so much! Paying your membership fees before the December 31 deadline not only qualifies you for a chance to win a nice gift, but saves the society additional postage expense having to send reminders that your dues are due. Here are the prizes for this year's contest: One year free membership to the VCBS; a lovely covered bridge welcome sign or a gift bag filled with covered bridge items. 2) Complete the membership form in this issue of the newsletter and return it with your check made payable to the VCBS no later than December 31st. The mailing address is: VCBS, PO Box 97, Jeffersonville, VT 05464-0097. Your name will then be entered in the drawing for one of three lovely prizes mentioned above. Keep in mind that only memberships paid by December 31st are eligible for this contest. Don't wait until you get so busy with the holidays that you forget to send in your membership dues as you will miss out on some nice gifts. Do it today while you are thinking about it. Winners will be announced in the winter issue of our newsletter. *To save you time, you might like to consider paying your membership fee for two years, instead of one. Or, think about changing your membership or joining one of our Giving Societies mentioned on the form. Your support is so important to our preservation work and what a nice gift to the VCBS too. On July 2nd, my family and I visited the Coburn Bridge (first of many we saw on our three days in VT). We were horrified to see a huge RV pulled up to the portal of the bridge. One man was on top of the RV trying to see if they could get it onto the bridge. He was actually laying there, trying to see if his arm would fit under the portal boards. The AC on top of the RV would never had made it under those boards! I told them they could not cross that bridge, but I think they knew that already. As I aimed my camera at them, the RV was slowly (and skillfully) backed up and turned around towards Rt 2. There is a yellow warning sign at the entrance to Coburn Rd (as you know) to let folks know of the 9' 8" clearance ahead. People like that are just plain scarey! I love Vermont and its covered bridges and it would sadden me to see one lost to such carelessness. Thank-you to all volunteers to date and also to those supporting up-coming events. The Montshire meeting will be an outstanding event - commercial ads for the related covered bridge exhibit are already on television. These events are the backbone of VCBS activities and volunteers who support them and put them together are its life-blood. All members who want to be a vital part of these activities and events are most welcome. VCBS elections are coming up this fall. Please consider running for a VCBS office and/or appointment as a committee chair/member. Let me know of your interest and your name will be put on the ballot or appointed to whatever committee work you desire. One further note: Thank-you to Bill McKone for the $210 donation he earned for VCBS as a volunteer for activities in the events of another organization. 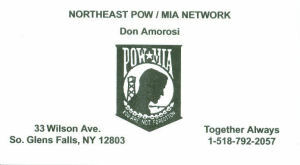 The goals of our organization match those of activists nationwide in our approach to the Prisoner of War /Missing in Action issue: the return of all LIVE American POW/MIAs, repatriation of the remains of those who have died, and comprehensive explanations for cases where the previous two options do not exist. Our efforts are to establish awareness in our Country that will reduce such losses to the lowest possible level during present and future operations against America's enemies. Great attention paid to maintaining physical reminders of the issue's continued significance. Symbolism in the form of the international logo's appearance on flags, pins, decals, articles of clothing, and accessories bolsters awareness. Wearing POW/MIA bracelets honors those individuals who still wait and evokes conversations on the issue. We are involved in acquiring and disseminating information on this issue. Presentations and discussions with community organizations, schools, veterans' organizations, and through a broad spectrum of events allow us to convey our concerns to the public. We are actively involved in the legislative process, as we attempt to provide protection for those who serve our Country, and for their families and loved ones should loss occur. We attempt to address the needs of families and returned POW/MIAs, and assist in coordinating activities with associated groups and promoting effective information flow. We are a volunteer organization, veterans and non-veterans, using awareness, communication, education, legislation, and compassion to assuage the pain associated with one of the most devastating outcomes of service to one's Country. As we honor POW/MIAs, returned and still waiting to come home, we aggressively pursue means to return the missing and protect those serving.